Gunsgreen House is a fantastically flexible venue which prides itself on its personal touch and warm, welcoming atmosphere, making it ideal for wedding parties of between 2 and 60 guests. There are several licensed rooms to choose from for your ceremony, including the Drawing Room with its spectacular sea views, which seats up to 60 guests, and the Blue Panelled Room, which seats up to 20 guests for a more intimate ceremony. Other options include the atmospheric vaulted cellar and the dramatic outdoor forecourt right on the water front. The venue also has space which overlooks the pretty harbour for a marquee for larger wedding parties or where live entertainment is a feature of the wedding celebrations. Behind the house is Nisbet’s Tower. This beautifully converted dovecote makes a wonderful romantic hideaway for the wedding couple, while Gunsgreen House has its own stylish self-catering accommodation sleeping 11 people. You’ll also find a good range of B&Bs, self-catering and hotel accommodation in and around Eyemouth, mostly within easy walking distance of Gunsgreen House. 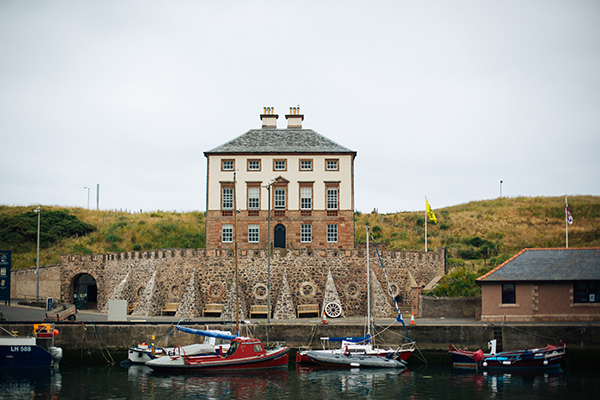 Eyemouth is just 5 minutes from the A1 and around an hour from Edinburgh or Newcastle, with the main line Berwick Railway Station only 15 minutes away, making it a great destination if you’re inviting guests from further afield. The village itself oozes charm, with lots of quaint local shops, museums, galleries and its own RNLI station, as well as fine eateries known for fresh local seafood and award-winning ice cream! Take a boat from the harbour to experience sea fishing or the thrill of a trip on the Rib Boat. The coastal path passes right in front of Gunsgreen House, so it’s perfect for walking and exploring the ‘Smuggler’s Coast’. The area is also renowned for spectacular diving as well as world-class marine and bird life for nature lovers, so you and your wedding guests can be sure of a memorable and relaxing time in this friendly corner of the Scottish Borders.